Location aware customers have intrinsic value that if understood and approached properly can bring enormous value to your business. Unfortunately most business owners are not marketers which means they mistakenly attempt to sell things they think location aware customers want rather than going deeper and addressing the actual desires and dreams of this specific type of customer. So how do you sell to location aware customers? To begin with, customers who are location aware are a completely different breed of customer than non-locationally based customers. This difference can be as stark as someone who has intentionally followed, tracked and engaged your services versus someone who ends up being your customer simply because you are the only game in town. 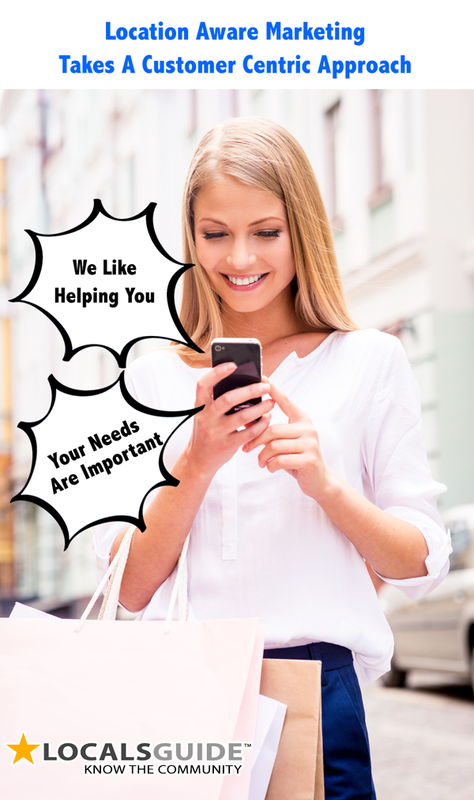 Location aware customers make choices that identify quality and expectation. If your business is ignorant to these qualities and expectations you will lose valuable leads that can cost thousands of dollars or more. The truth of the matter is that location aware customers have intrinsic value that goes beyond that of a traditional cold-call customer. The first and most important quality of location aware clients is that they have actively choosen to be location aware. This choice identifies individuals as people who want to be connected with and learn more about their specific locality. This choice also points to an active attention and expectation for making and entertaining decisions. I am not saying that all location aware customers are highly savvy but you do need to take into consideration that they are potentially moving through a more nuanced choice matrix. When location aware customers begin to rely on proximity based notifications they stay informed and this awareness then actively begins to shape choice and expectation. When you as a marketer / business owner realize this you will understand that the primary purpose of your location aware marketing needs to revolve around supporting the needs and desire of the customer dream and expectation. What is the dream of your location aware customer? Unlike non-location aware customers making an entry into an arena with limited choices, location aware customers can come with a potentially enormous awareness of a locality from the influence of user reviews, price awareness, and mere listing placement. 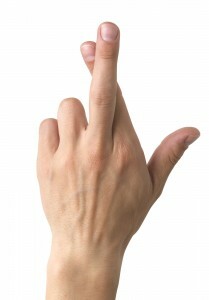 The attention coming from location aware customers can be a double-edged sword, one of both prejudice and expectation. What does this mean to you…? It means that you need to be paying as much attention to location aware customers as they are paying to your business. 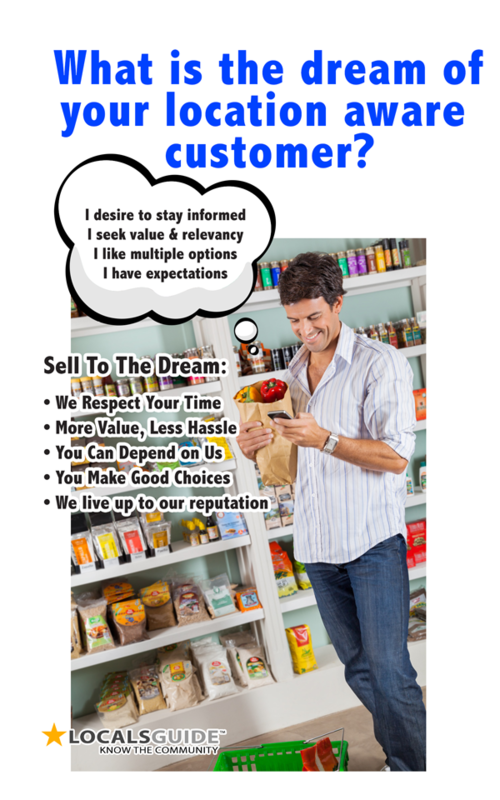 You need to maintain an active awareness of the customer perception of your business. If the location aware customer is already coming with expectations and preconceived perceptions of your business, then you need to be able to respond by being able to enhance, support or modify this perception. If you meet location aware customers as a stranger at the door you can expect the same. Let’s go deeper into the dream of the location aware customer. The dream of a location aware customer is essentially local awareness. This is an individual who wants the insider’s local guide view of the landscape. 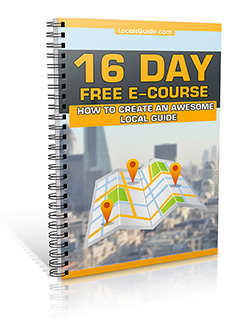 If you are working with products, take them behind the scenes to help them to feel like a local. The location aware client has taken the time to choose you. They have an overall awareness of multiple choices and after all that if they are still choosing your services, then I guess that makes you pretty unique. Understanding the unique opportunities for developing and marketing with your own location aware mobile apps is an important business advantage which if done properly can keep you close at hand to your best clients all around the world. 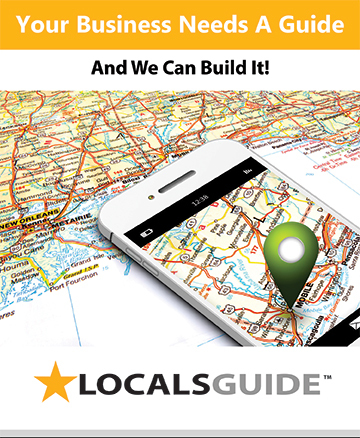 If you would like to learn more about how to create your own LocalsGuide customer app please view our demo.